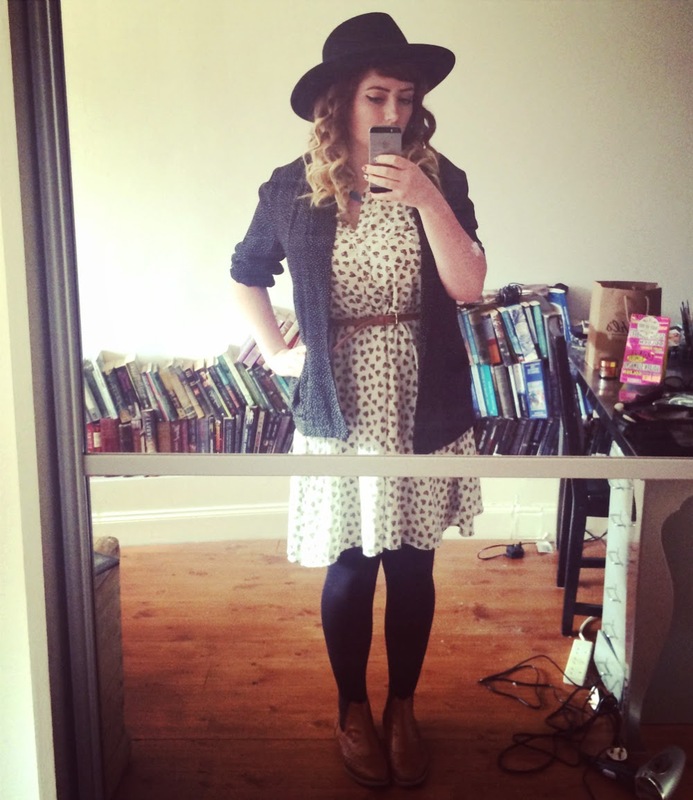 Ever So Juliet | Edinburgh lifestyle blog: Outfit: hello hat! I haven't really worked out the best place in my flat to take outfit photos (and I'm very aware that I should probably stop thinking of it as my "new" flat as I've been there for almost six months! ), but I am pretty into this outfit, and wanted to share. I'm a big fan of cosy hats in Autumn & Winter, but always tend to be a bit of a wimp about wearing them in summer. I imagine glamorous models strolling around Paris in wide-brimmed hats and pretty dresses (or see the likes of What Olivia Did or WishWishWish doing exactly that) and get a bit intimidated. I don't look like they do (and I definitely can't pose like they can!). I'm just a wee former-scruff who has aspirations of dressing well, but frequently lacks the time/effort/funds to do so. When I was last in London I was blethering about this to my best girl Steph, who promptly curled my hair, put a hat on my hand, and announced we were going out hat shopping. (This is said hat, which she also gifted to me. She's a good one, she is). So we went and tried loads on! And under the super Cockney eye of a London stallholder, I found this beaut. So now I'm a hat owner! And, okay, I am perfectly aware that hats are just a NORMAL and fairly boring accessory that loads of people own and wear. But it feels like I've made another wee step into being braver in what I wear. Picking things because I really want to, without comparing myself to others, or feeling a bit shy about it. And that's why you're all being subjected to this grainy instagram snap. Buy a hat.Take your own posey photo. But mainly, have fun with what you wear and why you do it! I like this, I like that I am not the only person that gets the hat fear - do I, don't I, what will my peers think?! Love this style, it sounds like country music ;) !! !